Info "Find everything that's wrong." Same Diff is one of Orbulon's microgames in WarioWare: D.I.Y. The point of the game is to spot the differences between the two pictures. The player needs to inspect the picture on the left and then find the differences on the image to the right. There can be as little as two or as many as four differences in a given picture. If the player finds all the differences before time runs out, the game is won. 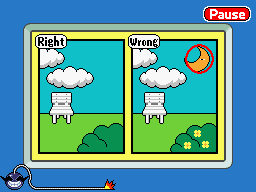 However, if the player doesn't find all the differences when time runs out, the game ends in a loss. This page was last edited on July 19, 2018, at 09:51.